No change expected. Decision at 8 PM ET/0100 GMT. The RBNZ are largely expected to keep the OCR unchanged at 1.75%. The rate has been at 1.75% since November 2016. Today will keep that streak alive. The announcement will be accompanied by the Bank's Monetary Policy Statement, a quarterly event. At the November meeting, the Policy assessment read. The Official Cash Rate (OCR) remains at 1.75 percent. We expect to keep the OCR at this level through 2019 and into 2020. There are both upside and downside risks to our growth and inflation projections. As always, the timing and direction of any future OCR move remains data dependent. The full monetary policy statement can be found HERE. Eamonn has some expectations from some financial institutions HERE. The main takeaway will be if the RBNZ pushes its implied OCR hike projection into 2021. Technically, the pair has moved down to the 100 day MA today and stalled. The 100 day MA is at 0.67196. 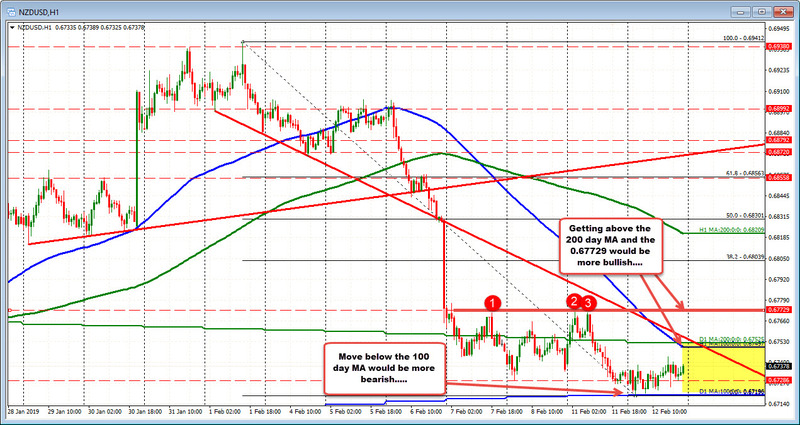 A move below would be more bearish, with the swing low from January 22 at 0.6706. Below that the 50% of the move up from the October low comes in at 0.66963. On the topside, the 200 day MA is not far away at 0.67525. 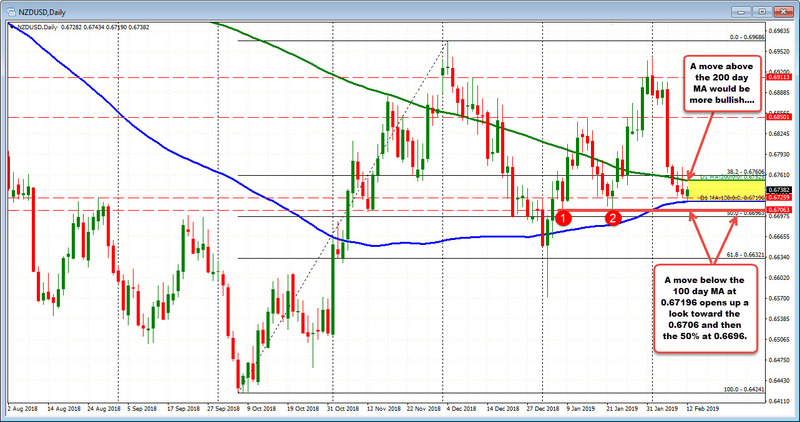 Move back above that MA on the headlines, and the upside will open back up for a more serious corrective move higher. Yesterday and last Thursday and Friday (see hourly chart below), saw the pair trade above and below the 200 day MA as the market consolidated waiting for the next shove. The high over those days, comes in at 0.67729. A move above that ceiling will be needed to get shorts covering with a look toward 0.6800 as the next target.